If ultimately you’re called into a mission, once you’re scrambled the importance of patience is still very much in play. You do not know if you’ll be able to achieve the goals that you have been tasked with. The situations that you may have to deal with are fraught with elements that can compromise success. Weather, technical issues, safety and security… there are so many reasons that may force you to delay or abort your mission. You just have to be focused and patient. Sometime the goal itself can still be slightly different from your own beliefs and you have to find a way to deal with that. At the end of the day you are just acting for the community good without expecting anything in return. Pilots and officers are given the authority to make decisions in a variety of situations. In a cockpit, in a squadron, in a training organization, in central command headquarters; wherever it is, you have the responsibility to weigh all the elements that will let you or the entitled authorities make the proper decision at the “right” time. You need to consider the environment in which the action related to your decision is taking place – accurate intelligence and solid analysis is crucial. A comprehensive knowledge of the time and resources that you have at your disposal is also essential. The elements involved might be crucial and highly sensitive, and the gap between ideal circumstances and the reality you’re dealing with is sometimes concerning. All of this withstanding, you still have the responsibility to use your judgement in making the decision to either pursue course, or if necessary to modify the plan. Sometime you must overpass what you have learned before and go beyond the drills that you have performed countless times. Whether it is Strategic, Operational or even Tactical, at any level planning is one of the keys to your success. Planning will help you to have the guidelines and a defined path that you’ll always be able to refer to in order to achieve your goals. Planning requires the management and analysis of huge amount of information. You have to be able to gather, cross-check, understand, select, simplify in order to create, resolve, plan and schedule a course of action. Conducting and leading operations requires a deep sense of adaptation. Fortunately most of the time you’re not on your own and you can rely on the skills and support of your crew. You can also rely on any number of specialists to actively help you in an impressive breadth of areas with a tremendous diversity of knowledge and skill; sometime onsite, sometime remotely; sometime immediately, sometimes with a tense delay. You are not isolated, and even in the worst case scenario, you can draw strength from the expectation that specialists – for example a task force – are working to execute a new plan to recover you. Ah well! I am their leader, I really ought to follow them. Communication and leadership by example are two key factors when you are managing a cross-functional team or working in a pluri-cultural organization. Be honest with yourself; if you’re not, you’ll have to suffer for your dishonesty at some point. This is particularly true in areas where cultural differences are significantly marked. You have to use the best of your skills and know-how to craft and deliver your message in an effective way. Most of the time, disagreement comes when we can’t understand each other. You have to find the way to soften those differences. This means listening, teaching, explaining, convincing, arguing to finally achieve an agreement, with varying degrees of compromise. And finally, when the time comes for recognition, if you can’t provide any medals or rewards, remember always to say “thank you” and show your gratitude with honesty. Learning is a centerpiece of life and we are learning everyday. People used to think of the Air Force as the highly technical branch of the military. Since it takes a lifetime to be a specialist in one’s domain I have waited until the end of the week to talk about this topic. We never stop learning new things. You have to remain curious in order to implement the latest technologies, discover and master the most state of the art tools. During my career, I’ve studied and learned much more than Aeronautics Engineering and Aviation; Psychology, Management, Information Technology, Economics, Geopolitics, etc. – again, it’s a game of planning and patience as you must wait for the opportunity to apply your knowledge when (and if) it’s needed. Despite the uncertainty of “when” the important thing is to stay committed to learning everyday. Knowledge acquisition is fundamental, but we also have the responsibility to share our expertise with our peers and those who come after us. Teaching and sharing a new skill with the next generation of specialists becomes even more exciting. Like a caring father you just want to make sure that you leave those who follow you well-armed and prepared. Listen! Know yourself and your limits. When it’s time to stop, you need to say so, and do what is needed to preserve yourself. You have to encourage the same thing amongst your staff, and sometimes you’re the one who has to fix the limits – because a lot of people won’t dare to ask for themselves. So today I’m keeping it short in order to enjoy some rest – and I hope you will too. Next Monday could be the day you see your hour of glory… or it might be just like any other Monday. Thanks for reading, and cheers to new beginnings. This series of daily articles resonates as my tribute to the French Air Force, all the security forces of France, those living in France, and all the people and countries of the world who are carrying the weight of its universal values “Liberté – Égalité – Fraternité”. 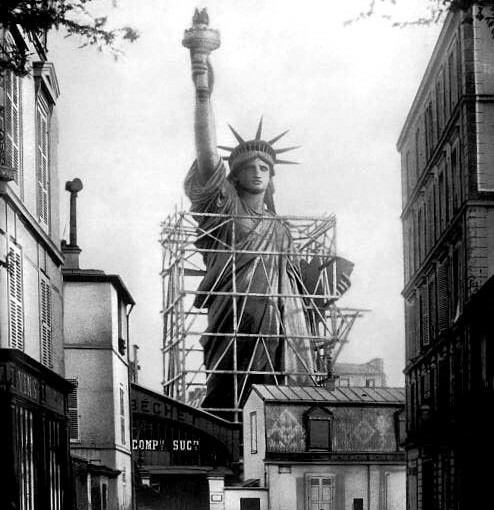 Lady Liberty, facing the city which gave you form – how you must mourn to see what has been done to Paris. While working on this article I referred several time to the site Military-Quotes.com.